The French resistance to the Nazis in WW II was much celebrated after the war. Whatever their actual resistance and organizing, however few or many their numbers, by the time the post war decade began in 1950, every Frenchman had taken part; stealth and courage restored the honor lost as Germans strode the streets of Paris. The legend has grown in film, book and song. Italian resistance is not so well-known. Mussolini was forced out of leadership by the Grand Fascist Circle, in July 1943, and the Nazis took over as occupiers, no longer hidden behind the Italian army. New divisions were sent in from Germany (totaling some 600,000 men by June 1944.) When General Badoglio, the new Italian Prime Minister, announced a treaty with the advancing allies on September 8, 1943, the national army broke into pieces. Ninety-four thousand Italian soldiers joined the German army; many hundred thousand were captured and deported to German work camps. Tens of thousands deserted and headed home, some into the hills to become partisan fighters, especially in the north. Beppe Fenoglio was one of them. He fought in the area then, and now, known as The Langhe in Piemonte. And he wrote. A collection of 12 short stories The Twenty-three Days of the City of Alba (tr John Shepley, 2002) / I ventitre gioni della città di Alba, 1952 takes as its title and main story the 23 days in which local partisans ran Italian and German units out of the city of Alba — now better known for the fine wines and fertile hills — the Barolos, Barbarescos and Barberas. His novel, Johnny the Partisan ( tr Stuart Hood, 1994 /Il partigiano Johnny, 1968 ) is a longer look at the weeks before, during and after the liberation of the city; partisans assembling, raiding, waiting, taking over the city, being run out, fleeing from the Fascists. He writes in a purely idiosyncratic way, sometimes with stunning and unexpected images, sometimes with such baroque embroideries of language, afterthought and circumlocution, often in English, that it takes a reading or two to get what he means. “Johnny” is one of those who released himself from the Italian army. He stops by his parents’ home in Alba, still in Fascist hands and is hurried to a small hill-side hut with a view of the city, which is in the process of being reinforced by German soldiers hastily caravaned from Milan and Asti. There he is alone, and soon bored with hiding, with reading (in English), and with insomnia. This is a fine early example of Fenoglio’s signature style: the anthropomorphizing of nature, the use of English scattered through the original Italian text (indicated by italics in the translation), the unexpected adjective – “treacherous”- changing a color or density description to one signifying danger, soldiers, and war, finishing with the very odd image of poplars like decks of card in a juggling act. Unlike so many war related novels, or memoirs, Johnny the Partisan, has few unit-sized battles, or long-bonding between certain men. Partisans come from everywhere; they come and go. Some are wretches, some are men of steel. We get a good sense of the various parts of Italy at the time: accents are noted — he has “an island accent,” means he is Sicilian — and is strange to the point of mistrust in the north. We see the two major competing partisan tendencies – the Blues (Monarchists, supporters of the King) and Reds (Communists with decades of political, though not military, organizing.) There is competition from the beginning of the resistance: who gets air-drops from the British, who takes a town, who holds it. One of the political commissars invites Johnny to an evening class on Marxism. Johnny refuses, twice. All he wants is traini ng in weapons. Stand-offs, one group holding someone from the other until reason reasserts itself, escalate to armed confrontations. Even, or especially, under attack, loyalty to ideology trumps the common defense. We get a thorough sense of life in rural Italy, 1943 — so unlike the fine restaurants and luxury wines welcoming tourists today. There is little electricity, especially in the hills. Life is lived in sheds and rustic homes instead of great vineyard estates. Peasants with very little education, driving donkey carts, raised for centuries to till the land; the women … “almost drowning the girls in the waves of their skirts, which were soiled and stank of the goat pen;” bitter and unmitigated cold. The descriptions of bone-soaking rain almost make the Western Front seem temperate. 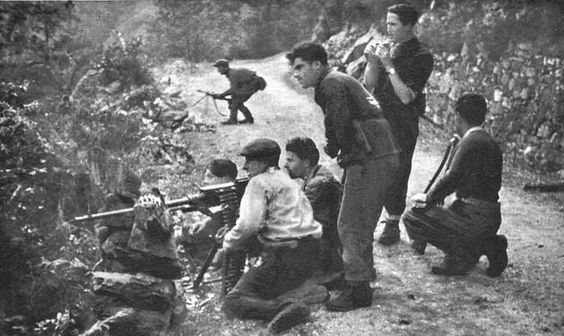 Italian partisans in Val di Pesio, Piemonte. Finally, in October, the partisans have assembled some 1,000 men, and taking the city seems possible. First, a negotiation. The Fascists understand the argument and are allowed to leave, with what they can carry, weapons and all. The partisans do their best to march, solider-like, into town. “In the air was the exciting and oppressive boom of the citizen’s cheers and the din of all the many bells of the town. Shutters opened like shots, people rushed to the balustrades as if they wanted to dive down for a total and immediate embrace, The urchins were already going in and out of the legs of the advancing partisans overcoming with the love of younger brothers the panic sense of weapons, uniforms and faces. Fenoglio’s descriptions of wounds, fear and death are as powerful as anything I’ve read. Blood and rain coursing over a wounded man “fighting with alternating success to paint his face red and then white again” is only one of the many powerful visuals he creates. He is also one of the few of the war writers (excluding journalists’ accounts) who brings the flights of terrified civilians into the story. Some abandon the holes they have dug in the hills on rumors of German dogs; some have stayed underground the entryways covered with manure to confuse the dogs. Some have been hanged, barns and homes burned. Sacks of grain for the coming winter have been sliced open and driven over by huge wagons until completely mixed with the mud: famine is in the offing. Like virtually every novel/memoir written by former soldiers, the plot line of Johnny the Partisan, follows the sequence of days. There are no secrets to uncover, except tomorrow; there is no cutting from time past to time future, or place present to place remembered; actions are themselves, and not meant to allegorize or foreshadow later events. Women enter and leave, some as nurses, some as cooks, some as mothers, some in brothels, but there is no love-story embedded, no parallel life beyond the boredom and the fear of battle. And, like other such novelized remembrances, with not plot climax or resolution, the story of days goes on a bit too long. Evasion and escape true to life but repetitious in the telling. Nor, like most soldier-written books, is there any meditative space to consider the origins, the moral weight, the possibilities to follow the war. No one asks, why did this happen? Did it need to happen? There may be a line or two of fellow feeling with a soldier on the other side; it may be more difficult to kill a lone enemy at a quiet moment than massed with other in the heat of a battle, but no foundational questions are posed; no one wrestles with his soul. Like many such books, Johnny The Partisan will appeal more to those interested in particular times and places, or the behavior of men in battle than to those looking simply for a good read. Fenoglio is acute and perceptive in his sketches of men but it is not a novel of deep psychology or a study of the human character. What he does bring, with rare gifts, is the unexpected turn of phrase, the image that sometimes, is so unique, that it distracts from the sentence or paragraph. We are reading, after all, about men at war; being startled by a novel coinage can sometimes be distracting. Such inventions of language are remarkable and numerous. He reminds me much in this of Louis-Ferdinand Céline in Journey to the End of Night, [review here] the first section of which is also about men and war, WW I. In addition, however, this is a translation. Stuart Hood for the most part allows Fenoglio his head; he accepts the inventions and allows us to hear them in English. There are some infelicities, however, and enough to add to the distractions of reading. Perhaps the original reads as oddly to an Italian reader, though I don’t think so, from my scanning of it. Even if so, I would have liked to see many such pebbles smoothed out by a good copy-editor; they seem to be less an issue of translation qua understanding, and more of not having read it fresh in English once the translation was done. “Someone started to condole with him.” Really? For some of you, Yes. It will add to your sense of Italy, of war, of how men outside traditional military structure respond to war, of WW II. For others, perhaps knowing that indeed Italians rose up against their occupiers and their own Fascist countrymen, joining the allies in the last desperate months of fighting, will be enough. For an easier entry into some of the details, try Fenoglio’s collection of short stories, which his Italian editors suggested he cull from the longer novel: The Twenty-three Days of the City of Alba (tr John Shepley, 2002) / I ventitre gioni della città di Alba, 1952.